How Mature is Your Website Localisation Strategy? Expanding your business abroad is a major undertaking and most businesses take a long time to reach an advanced state of maturity in their website localisation approaches and the digital marketing strategies and tactics that support them. Most savvy businesses know that translation, although critical, is only a small element of a website localisation project. Businesses owners and managers need to consider how their translated content fits within their expansion strategy and what can be done to improve performance. 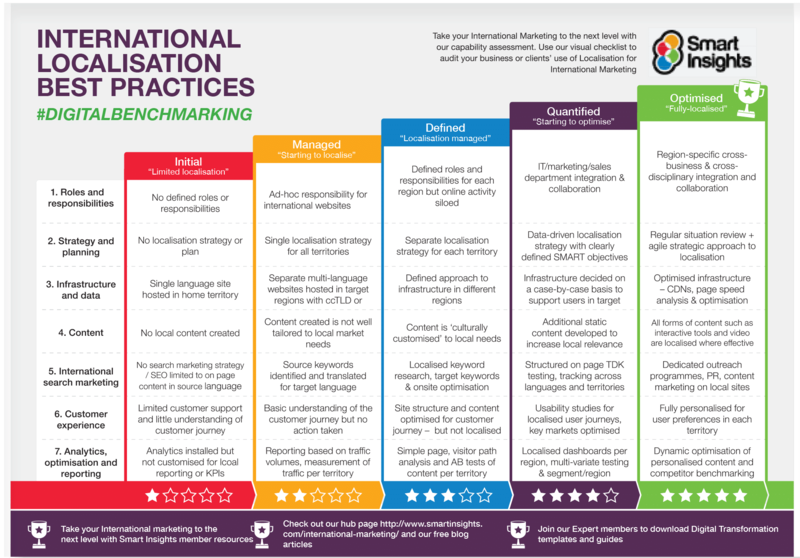 To place localisation in the wider context of your digital marketing capabilities, we’ve teamed up with Smart Insights to create this table to help you explain to colleagues your current use of localisation and how you aim to develop them. Smart Insights specialise in advising medium and large businesses on digital marketing strategy and optimisation using structured frameworks to improve the results from their digital channels – we recommend you download their other digital benchmarking templates. For more information on website localisation best practices, download our guide to website localisation.